Heat pumps Scotland, ground and water source heat pumps, air souirtce heat pumps and underfloor heating by Incognito, Glasgow - Edinburgh - Aberdeen. The most common heating sources have for a long time been non-renewable fossil fuels and electrical energy. High energy prices and the increasing interest in the reduction of carbon emissions are boosting the market for renewable energy sources in Scotland, such as heat pumps. Tomorrow's heating technique is available today! Heat pumps have been a common feature in the Nordic regions of Europe for many years and Glasgow had one of the first Underfloor Heating systems at the Bearsden's Roman Baths. A heat pump provides an economical and environmentally friendly method of heating. It makes you independent, it cuts down your heating costs and it is high technological and almost totally maintenance free. 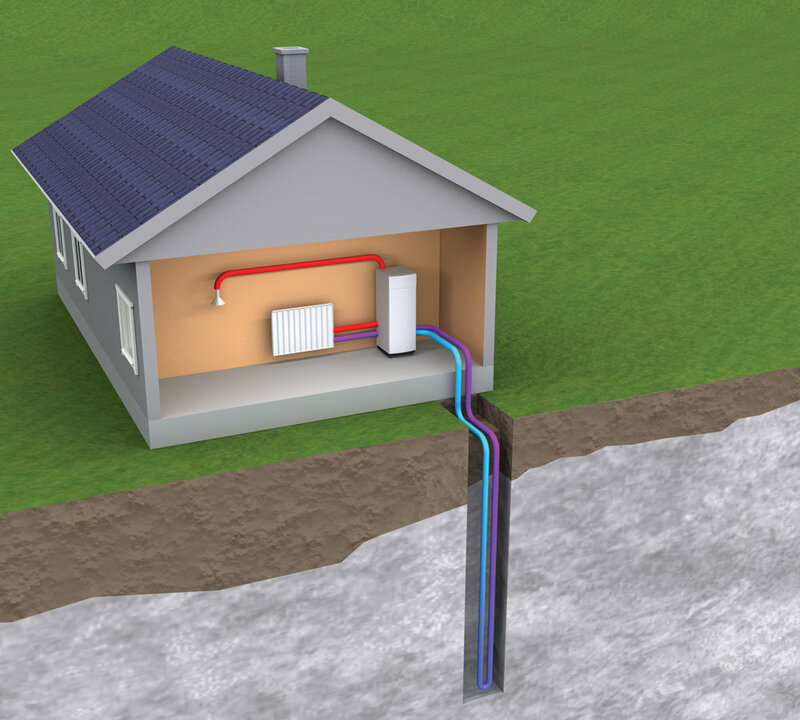 The Heat Pumps from Incognito in Scotland work by extracting an inexhaustible free supply of solar energy stored naturally either in the ground, air or water and utilising it for domestic underfloor heating and hot water. In order to access this free environmental supply electric energy input is required. In a well insulated property, every 1 kilowatt of electricity used to power the heat pump can provide up to 4 kilowatts of free energy. Heat Pumps are simple, well-proven machines that can provide your entire central heating and hot water requirements. With fewer moving parts to go wrong, heat pumps have a life expectancy of over 25 years, and with no annual service or maintenance required, ongoing costs can be reduced by as much as 75%. The basic principle of a ground, water or air source heat pump is to take low-grade heat from the ground, and convert it to high-grade heat for your house using refrigeration technology. For every 1kW of electricity consumed by the heat pump, over 4kW of heating can be supplied to your home. The basic principle of a heat pump is to take low-grade heat from the ground, the water or the air and convert it into high-grade heat for your house using refrigeration technology. For every 1kW of electricity consumed by the heat pump, over 4kW of heating can be supplied to your home. "heat pumps are not a substitute for a well-insulated property"
A practical application of this technology is the household fridge, where energy contained in foodstuffs placed inside is extracted and dispersed through the radiant fins on the rear of the unit, which is why you can often feel warmth around a fridge. Commercially available heat pumps have been manufactured since the 1970’s although earlier versions had been in existence at least 20 years before that. As with all significant advancements in technology, it takes something of a crisis to provoke it. In this case the OPEC oil crisis in the 1970’s gave the necessary catalyst for development of a clean energy source. Countries such as Sweden took a lead and is now home to a number of household names in heat pump manufacture. The European and Scandinavian markets are much more developed than the UK, to the extent that public acceptance and understanding of this technology is very high. Due to the readily available and cheap natural gas available in the UK, up until now there has been few compelling economic reasons to invest in a heat pump. However, this is changing as the practice of burning fossil fuels comes under increasing scrutiny. The UK has signed up to the EU’s Renewable energy directive, which sets a binding target of 20% final energy consumption from renewable sources by 2020. The RHI scheme is a long-awaited development that rewards investors by paying a tariff on every kWh generated by the heat pump. The scheme is available in both Domestic and Non-Domestic forms. As Government money is being invested in the scheme, the rules regarding compliance are strict and closely monitored. Great care is taken to avoid misuse of public funds, for example the scheme is strictly for individuals and is not open for construction companies- such companies can be obligated to install renewable energy heating systems through ever tightening Building Standards and are not considered to require incentivizing. There are still considerable areas of the UK that are off-gas, especially in Scotland. If you live in one of these areas then the financial argument for a heat pump becomes extremely strong. Long term, it may be anticipated that Government support for heat pumps will be removed as the technology is fully embraced and their use becomes widespread. It would not happen immediately as the Government has measures in place called degression. When take up of the scheme hits a certain target in a period of time, the scheme is reviewed, and future tariffs are adjusted downward. Historically the tariffs for ground and air source have been maintained and haven’t yet been subject to degression. Obviously, the scheme is dependent upon Government support and could be pulled at any time- that said, the scheme has survived several different political administrations and the issue of climate change remains an emotive one on the agenda. In case anyone is alarmed, for everyone currently signed up to the scheme, your tariffs are set in stone and will run for the remainder of the term- 7 years for domestic, and 20 years for non-domestic. A few feet below the surface, the earth in your garden remains at a constant temperature all year round. Heat pump technology simply extracts this free energy. The seemingly low ambient temperatures are enough for a ground source heat pump (or geothermal heat pump) to heat your home. The compressor, which is driven by an electric motor, compresses the refrigerant to form a high temperature, high-pressure gas. This gas then passes into the condenser (plate heat exchanger). The water from the radiator system is also pumped through the condenser where the heat is transferred from the refrigerant to the radiator water. As a result the refrigerant is cooled and condenses, changing state from a gas to a liquid. After the condenser, the refrigerant passes through an expansion valve, which rapidly drops the pressure, and therefore lowering the boiling point of the liquid. In the evaporator, the refrigerant takes up heat from the water/glycol mix that is circulating in the ground loop and boils. In this process, the liquid turns to gas and returns to the compressor to begin the cycle again. This in turn makes the ground loop water cooler that is then pumped around the ground loop in the garden for reheating. You can read more about ground source heat pumps on the website of the Energy Saving Trust: ground source heat pumps. 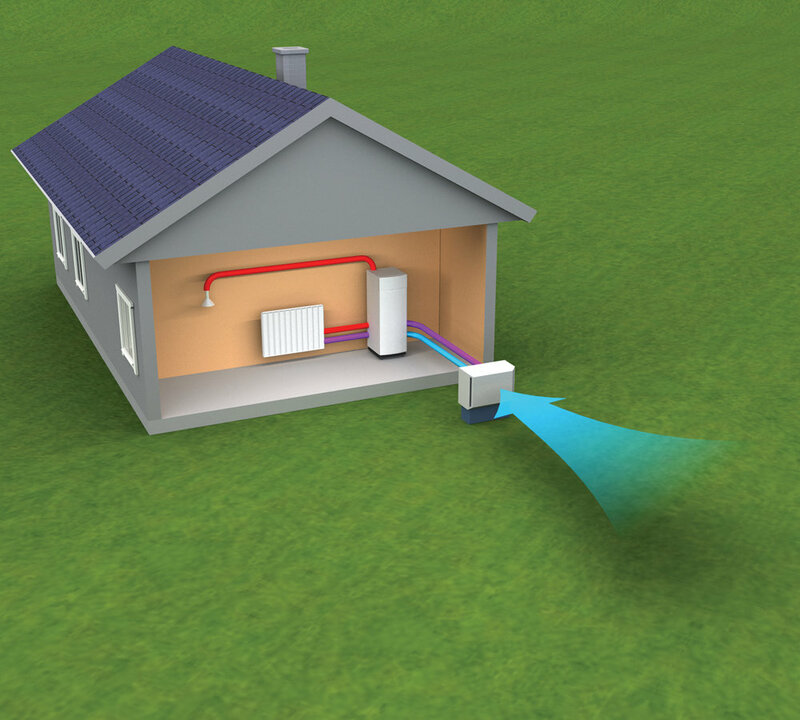 An air source heat pump technology is simple at its heart. During the day the sun’s rays heat up the air. Heat pump technology simply extracts this free energy. Even at ambient temperatures as low as -20°C there is enough heat in the atmosphere for an air to water heat pump to heat your home. The only additional energy the system requires is the power to drive the heat pump compressor. In fact, if the heat pump is connected to a clean energy source, such as solar power (ask for further details), running costs and CO2 emissions can be reduced even further. Outside air comes into contact with the liquid refrigerant in the evaporator. The refrigerant absorbs the ambient heat from the air and evaporates. The resulting gas passes through to a compressor, which increases the pressure, and therefore the temperature, of the gas. The hot compressed gas now passes to the condenser where it is passed over a cold surface. This surface absorbs the heat from the gas and uses it to heat your water. As the gas cools it returns to its liquid state. The liquid travels to the expansion valve where it resumes normal pressure and then returns to the evaporator to be recycled around the system. The hot water is stored in the tank and then pumped around the house or to your tap to provide central heating and hot water as required. You can read more about air source heat pumps on the website of the Energy Saving Trust: air source heat pumps. A water source or lake heat pump effectively works in the same way as a ground source heat pump. By using heat stored in the lake water and lake bed. The collector circuit is laid on the bottom of the waterway and carries heat to a waterside home. 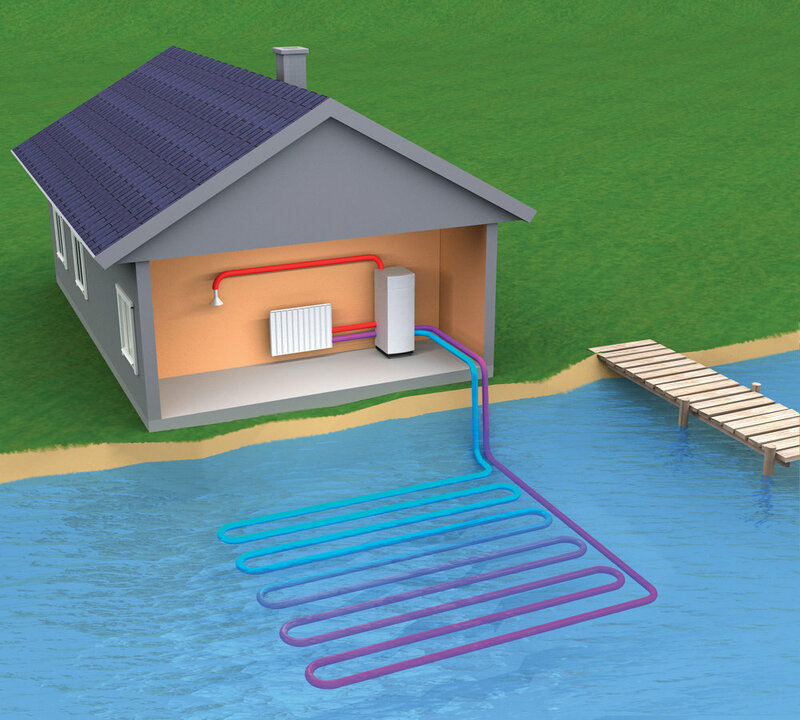 Using heat from a lake reduces energy consumption in a very efficient way. For more info, visit our renewable energy page. Perhaps the easiest thing to do is just to give Ross or Andrew a call with your specific question. It is easy and quick and they will be more than happy to share their knowledge!